In the States, Vanessa Mdee’s brief appearance in a hotel lobby might not ring any bells, but step into a hotel lobby in Stone Town, Zanzibar, and you’ll hear bells, whistles and blow horns. “She is our celebrity,” says a shy hotel clerk at the Zanzibar Serena Hotel. He’s gushing at her in between checking out the resort’s guests. With more than half a million social media followers—including celebs Kelly Rowland, Trey Songz and President Barack Obama (yup, POTUS)—Mdee, 27, is one of Tanzania’s most popular singers. 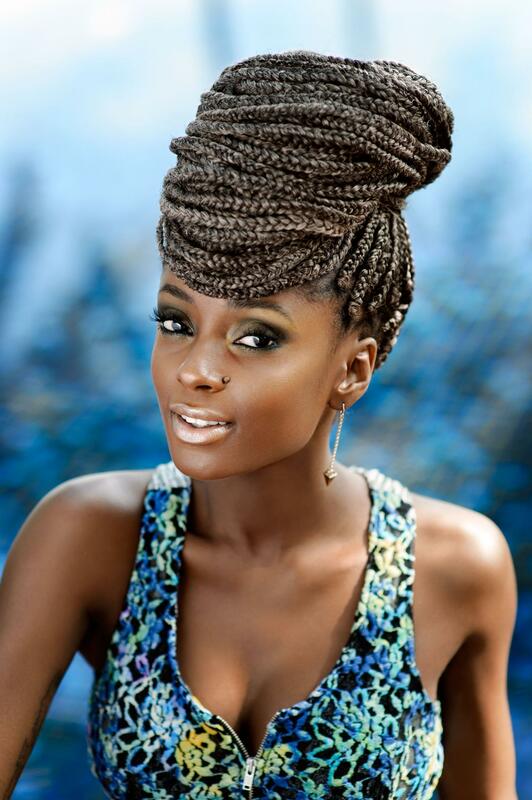 On July 18, the veejay turned singer is up for best female artist at the 2015 MTV Africa Music Awards. But to East African fans, she’s already a winner. Moments before we photographed her in Zanzibar—a 20 minute flight from her home base in Dar es Salaam—Mdee let us know a little about herself, Tanzania and “bongo flava.” Listen in. For those who aren’t familiar with your background, tell us how you became an artist. My sister happened to be dating one of Tanzania’s biggest deejays. He would let me go by the studio, so I was always around artists and the studio environment. I entered the MTV Base veejay search and won, a first for a Tanzanian. After a year of being on television, I started hosting a live radio show. It was perfect, but I knew in my heart of hearts I wanted to perform. I wanted to be onstage. I wanted to make music. I wanted to dance and I wanted people to sing along. But I had such issues with confidence and detachment. Like, I would make music and then say it’s horrible. I met David Banner last year when he was in Tanzania as part of a workshop for producers and artists. He told me that “every artist is like that.” He said, “If 75 percent of it sounds good, then let it go.” Now, I am a 24/7, 7 days a week fully fledged recording artist, performer, singer, dancer, rock star. Are you still a veejay? Listening to your music, it could easily be played on American R&B/hip-hop stations. But we’re curious: What is Tanzanian music today, and who are the top five artists—besides yourself—we should know? The sound of Tanzanian music comes from various genres. What makes it -specific to Tanzania is that we sing and compose in Swahili. With the New Age sound we’re creating, there’s a fusion of R&B, hip-hop, funk, soul and what is known as soukous or zouk or rumba—traditional African sounds. This fusion is creating a whole new sound. We call it bongo flava. The word bongo in Swahili means “brain” but Dar es Salaam, which is the commercial capital of Tanzania, is also called The Bongo. It’s like how they call New York City “The Big Apple.” The top five artists you should know are: Diamond—well he goes by the name -Diamond Platnumz—Ben Pol, A.Y., Shah and Navy Kenzo. What is traditional Tanzanian music? Traditional Tanzanian music is known as Taarab. It originates from Zanzibar actually. It’s inspired by a lot of Arab and Indian sounds, so a lot of flutes and a lot of harps and strings. It’s hypnotic. It almost sounds like what you envision a snake charmer would use to take a snake out of a bag. What has happened over the years, with the growth of the live band, there has been the addition of drums and guitar and piano. I think it’s more of a feeling than it is a particular sound. I notice you and your team are connected to Black American culture through social media. As an African artist, do you feel you have to stay connected to this culture? I grew up listening to a lot of American music. It’s something that, funny enough, Africans listen to today, yesterday, before, decades ago, you know? It’s been on our airwaves, so the culture is something that we may not necessarily understand but we are aware of. During my years on radio, I was constantly asking myself why is it that the culture is so dominant and that we are part of it inadvertently? I understand it and I acknowledge it. Because of the force that it is, you have to be able to understand how it works for certain artists in America so that you can either copy the formula or find ways to avoid what didn’t work for them. In Tanzania, is there an expected responsibility that comes with being an artist or can you just be the singer with a hot beat? It is very important [to be of service to the people]. Tanzanians are very welcoming. The thing about Tanzania which I love the most, is that we love thy neighbor truly. We really do. We will invite a stranger into our household and feed them for absolutely nothing and they can be gone the next day and you’ll never see them again. No questions asked. It’s one of those principles that has been instilled in us. It’s just our morals. Even as an artist you’re responsible for the other, and you have to take part in that which builds community. Before I leave Tanzania, where are the top five places I have to visit? You have to go to the Serengeti. You have to come to Zanzibar. If you can, you’ve got to climb Mount Kilimanjaro. I haven’t done that yet, shame on me. My father has done it five times. My mother has done it twice, so I’m embarrassed. I’d definitely take you to the hidden islands off the coast of Tanzania: Mbudya and Bongoyo. They’re 20 minutes outside Dar es Salaam. They’re just beautiful. They’re marine reserves. Gorgeous. The last one is my momma’s house. You can have some Swahili cooked food and some Swahili hospitality. Yes! Pickup ESSENCE’s Global Issue (on newstands now!) to find out more about dynamic Black women in the diaspora.